I am starting a brand new first edition game this Sunday afternoon for a group of six players. This game will pretty much only use first edition source material for the most part, at least to start (rulebook, sourcebook, Tramp Freighters, GG4: Alien Races, etc.). I have a pretty good handle on the core rulebook rules but I am wondering whether I should incorporate some or all of the rules upgrade into the game to start with. So I figured I'd come here for opinions from you folks on whether I should use the rules upgrade and if so, all or just some of it. So what parts do you guys like and not like? The expanded difficulty number ranges? The revised combat sequence? The changes to the stun effect? Which of these things are worth adding to the game? Keep in mind that I am not going to take any rules from the companion. This game will be strictly first edition core and maybe rules upgrade or portions thereof. I will run combat either by the core rulebook or by the upgrade. So lets hear any opinions you all have on the upgrade. What's worth using and what isn't? IMO, difficulty ranges are an absolute must. It addresses an fundamental flaw with 1e. The revised combat sequences attempt to address the mess that 1e combat can be, but it still doesn't have initiative so IMO it still isn't enough. GMs usually love or hate the Haste concept. You said you aren't going past the RU, so it's your call on the combat sequence. Sorry I'm not helpful there. The stunned rules are also GM preference. Do you want a character to immediately go unconscious when effected by a second stunned result, or do you want them to just suffer multiple -1D penalties? I remind that whatever you choose applies to both PCs and NPCs. IMO 2e handles it better than both of those options. Why do you feel that core 1e not having difficulty ranges is a fundamental flaw? Many games have static difficulty numbers. 5e D&D is generally a 5, 10, 15, 20, etc. structure for difficulty numbers. I know there are many others that I would have to dig a little deeper to remember that do something similar. My concern with the rules upgrade ranges is how to know when to have it be a 6 and when to have it be a 10 or when to have it be an 11 and when to have it be a 15. Since very easy, easy, moderate, etc. all have a range of 5, how do you judge where in the range a task should fall? And once you judge a task as an Easy 9 roll, when something happens that is similar five sessions later and the GM doesn't remember his Easy 9 ruling from the previous time, doesn't that create an issue? I mean, is it just as easy as this is GM fiat? The GM just decides that to do action A is Easy and then decide whether it is on the easier end of the Easy range or the harder end? Lastly, what about combat difficulty for ranges? If short range is a difficulty range of 6-10, how do you decide what should be a 6 and what should be a 10 and everything in between? I know that there is an argument to be made as to whether 1e combat is easy to run or hard to run but I'm not sure I'd call it a mess. For a novice to RPGs I can see it being more difficult to handle but for someone who has been playing games for a long time, I think it would actually flow pretty smoothly. At first I wasn't sure I was getting it, but now I think I have a handle on it. Same with the Rules Upgrade. Just trying to decide which I would prefer to use. The rules upgrade version of sequencing with haste included seems to me to be pretty well ordered. I like how most actions are near simultaneous in the five second round. In many ways it makes more sense for such a short combat round. In 1e core, the rebel and stormtrooper are firing at each other. The rebel rolls higher so his shot goes off a fraction of a second before the trooper. In Rules Upgrade, the rebel declares one haste and a shot. The trooper just declares a shot. The rebel fires first with -1D and misses. The trooper returns fire. Sure it can get messier with multiple combatants but I have seen far messier initiative systems (Aces & Eights I'm looking at you!). Regarding stunned results, I know that suffering -1D penalties for each stun result is from Rules Upgrade. Where does the immediately go unconscious when effected by a second stunned result come from? In the original core rules, I see only lose all actions for the remainder of the round, knocked prone and then suffer -1D to all actions the next round. Regarding 2e, I have nothing against that edition. In fact, I played that back in the day and enjoyed it. Its just these days, I prefer the simplicity of 1e. I like the fact that there are fewer skills in 1e, and I am not a big fan of the wild die. I think the wild die makes roll results too swingy. There is a 33% chance of rolling either a 1 or a 6 on every roll which either means the potential for a really huge roll or a really bad roll. I see why some would like it however. I just prefer not to use it. I also prefer the simpler wound structure in 1e (stunned, wounded, incapacitated, mortally wounded). The cool thing is though that 1e and 2e are largely compatible so it is easy to share rules between the two. I am well-aware that if I DID like the wild die but still wanted to play 1e, it would be very easy to just add it to the 1e rules. I also realize that if combat gets too difficult, it would be a simple matter to incorporate a perception roll as initiative into 1e. Like I said, I know there are fans of both 1e and 2e around here and fortunately the systems are married up well enough that rules can be transferred between them easily. 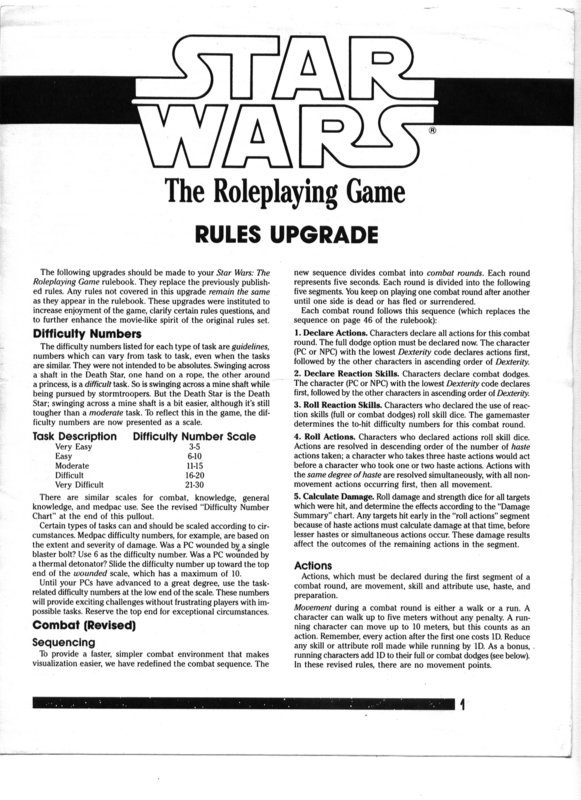 I have been using just the The Star Wars Roleplaying Game 1e rulebook, with the sole addition of the difficulty numbers from the “Rules Upgrade” (handily printed on the GM screen from the Campaign Pack). I’m not sure how this mechanic works in 1e pre-upgrade, but, this is clearly what every module uses, so, it is what I go with. Haven’t felt the need to do anything differently so far. Why do you feel that core 1e not having difficulty ranges is a fundamental flaw? Many games have static difficulty numbers. I didn't actually say that core 1e not having difficulty ranges is a fundamental flaw. I said that the difficulty ranges in the Rules Update "addresses an fundamental flaw with 1e." The flaw is the particular difficulty numbers they have for each level. They obviously just went with multiples of five because it was easy to remember without referring to charts, and it is that. But the average human attribute is 2D and the average roll with 2D is 7, which means average people are going to be missing a lot of "Easy" tasks. The average PC attribute is 3D and the average roll with 3D is 10.5, so that will hit a lot of the "Easy" rolls but the "Moderate" difficulty is 15 so it doesn't really seem that moderate. 4D won't even hit Moderate most of the time, and the 1e core book says that 4D is expertise skill level. Experts can only do easy or very easy things? The multiple of five static difficulty numbers are too high, just for the sake of being easy to remember. That is a fundamental flaw with the game system, and the designers knew it which is one of the reasons why they made the Rules Upgrade which started being included with the 3rd release for this game line. What the Difficulty Ranges do is keep the easy to remember multiple of five, but go down from those high static numbers. I personally have redefined the published difficulty ranges for my game, but you were asking for assistance between strict 1e core rules or Rules Upgrade for multiple considerations, and I answered Rules Update for that because it is closer to more direct association between skill level and difficulty numbers. Lastly, what about combat difficulty for ranges? If short range is a difficulty range of 6-10, how do you decide what should be a 6 and what should be a 10 and everything in between? If you do want to to do ranges, multiple 2e products give guidance for choosing difficulty numbers (and maybe the 1e Rules Companion which is a full book that replaces the Rules Upgrade). If you insist on not going any further than the RU, then you may not have the best possible guidance because you only have the original publisher' RU and our recommendations to start using the difficulty ranges. The revised combat sequences attempt to address the mess that 1e combat can be... GMs usually love or hate the Haste concept... Sorry I'm not helpful there. I know that there is an argument to be made as to whether 1e combat is easy to run or hard to run but I'm not sure I'd call it a mess... Sure it can get messier with multiple combatants but I have seen far messier initiative systems (Aces & Eights I'm looking at you!). Yeah I was paraphrasing you from the other thread. I said it "can" be messy like you did. No one was comparing any edition of Star Wars to those other games with messier initiative systems. You asked for a comparison on the two combat rounds, 1e core and the RU. I commented on the Haste concept from RU. Neither version has initiative and I apologized up front that I couldn't provide much guidance there. I thought I made it pretty clear up front I don't have a strong position on this question, which would mean I would not be the one to debate and hash out the merits of each system with. Again, I'm sorry. But if you want a further response, I guess combat in RU is probably a little better. I'm sorry captain that's all I can give ya! "A character who has been stunned by a blaster set on stun, has not yet recovered, then is again stunned by a blaster set on stun is knocked unconscious." I guess that doesn't address just getting multiple stunned results in general - It only addresses multiple stun results from a blaster set on stun. Sorry. I'm trying to be as helpful as I can but I haven't actually played 1e since 1990. The flaw is the particular difficulty numbers they have for each level. They obviously just went with multiples of five because it was easy to remember without referring to charts, and it is that. But the average human attribute is 2D and the average roll with 2D is 7, which means average people are going to be missing a lot of "Easy" tasks. The average PC attribute is 3D and the average roll with 3D is 10.5, so that will hit a lot of the "Easy" rolls but the "Moderate" difficulty is 15 so it doesn't really seem that moderate. 4D won't even hit Moderate most of the time, and the 1e core book says that 4D is expertise skill level. Experts can only do easy or very easy things? One thing that you're not taking account is that PCs and NPCs all have the option to Prepare for a task at hand. By taking a little extra time (5 seconds) they add 1D to their skill pool, improving their chance of success by pushing their average roll higher. If a PC/NPC is not under any pressure (not in a combat situation, or not under a time crunch) you would assume that, by default, they would always choose this option. Well, we got together and made characters and started the game today. It turns out we’re using 2e Revised instead of 1e. Most of my players and even me seem to kinda like it a bit better as it seems to be closer to the game experiences that we are used to. I do like a lot of what 1e brings to the table but 2e just feels like a better option for our group. So moving forward, if I have 2e questions, I will move to the appropriate board. I will probably actually run from the REUP book as I like how clean it is. Thanks for all the great advice so far! Whill, my apologies if it seemed like I was picking your answers apart. That wasn’t my intention but I realize it seemed that way looking at it again. I did indeed see that you stated you don’t have a strong opinion on core vs. RU. So sorry again if my questions and comments seemed like I didn’t read your initial comments well enough. As an aside, we tried a round of core 1e combat and a round of RU combat and it IS pretty messy! 2e R&E works better for my specific group. I am starting a brand new first edition game this Sunday afternoon for a group of six players... This game will be strictly first edition core and maybe rules upgrade or portions thereof. I will run combat either by the core rulebook or by the upgrade. But you seemed so sure that you were using 1e with or without the RU. What happened? How could you go from being sure you wouldn't even go as far as the Rules Companion to playing 2e R&E? Outvoted by the players? Was it the players' idea to play test combat first before agreeing to your earlier declaration? I am glad 2e worked out for your group after all. None of the above. We created 1e characters (laconic scout, minor Jedi, failed Jedi, bounty hunter and Ewok). Then we started an adventure of my own creation. Characters are on Tatooine, prisoners of Jabba. Jabba tells them he has grown tired of them, they are not entertaining him anymore. They are to do a job for him. Fail and they will be fed to the Sarlacc. A smuggler was bringing a shipment of spice to Jabba and crashed in the desert. The smuggler fled and left the shipment out there, supposedly in the clutches of the tusken raiders. The characters were dropped in Mos Eisley with their only lead that the smuggler was last seen there. They had a name (Ree Jexit) and a description (human smuggler). They found him, about to flee the planet on a Ghtroc 720. Two bounty hunters showed up at the same time trying to grab Ree before the PCs got him. They took out the bounty hunters and got a transponder receiver from Ree that would theoretically lead them to the crashed vehicle that he was carrying the spice on. Then went into the desert in a cargo vehicle of their own and found the crashed vehicle. They were ambushed by four tuskens. They took out three and they decided to let the fourth one run, planning to follow him to hopefully find the spice. The first combat, we ran with the core 1e rules for combat. The second we ran with RU for the first couple rounds and then finished with what was essentially 2e R&E. Of the three, we all liked 2e better. I also then discussed with them the wild die, more skills, character points, etc. But ultimately I just read the room and realized that we would be better served with 2e rules. The players are pretty willing to play whatever I decide to run so were okay with 1e but like the bells and whistles of 2e better. Sorry, that was a longer explanation of how things went than you asked for but I figured it would set the scene better if I gave a bit of the story that I ran for them. What I posted here is a very brief synopsis of what happened. There was some great role-play before the first combat, especially when the Ewok chose the bounty hunter to latch onto and the antics that ensued from there. I WAS sure I wanted to go 1e straight up or maybe RU but I am always open for change if something doesn't work as I expected it would. I tend to like rules-light systems these days and figured it was worth trying it out. But I do have experience running 2e a number of years ago, and I had actually NEVER run 1e before. I thought I'd give 1e a try but as I said, I'm not so rigid as to not be open-minded about making a change if I or the group feel it necessary. In this case, 2e will be a better fit for our group and it is still fairly rules-light compared to many other RPGs on the market. Yep, me too. I look forward to discussing the game in the appropriate 2e boards. I just printed out 2e REUP (all 508 pages! ) and will be taking them to my local print shop to get spiral bound. We are doing some minor conversion work on their characters and then we are ready for next session in two weeks. Another possibility would be to use the low-end number of each range, so a Very Easy would be at 1: effectively automatic success for anyone with 2D skill equivalent except for Wild Dice. The first combat, we ran with the core 1e rules for combat. The second we ran with RU for the first couple rounds and then finished with what was essentially 2e R&E... I WAS sure I wanted to go 1e straight up or maybe RU but I am always open for change if something doesn't work as I expected it would. We created 1e characters (laconic scout, minor Jedi, failed Jedi, bounty hunter and Ewok). Then we started an adventure of my own creation... We are doing some minor conversion work on their characters and then we are ready for next session in two weeks. LOL, What I put is the low-end number of each range. See the link below. The low end of Very Easy is 3 there. And there is no Wild Die in 1e. Sorry, I meant the 2E ranges. Oh, I've taken Preparing into account. So an average human preparing for a easy task gets to roll 3D instead of 2D. The average roll is 10.5, so that does just barely make it. But being that close, there are still going to be a large minority of times they will still fail at an easy task the have prepared for with no other distractions. And someone with a 3D skill Preparing for a Moderate task will roll 4D for an average of 14, so the average still comes in under Moderate/15. And 4D "expert" Preparing for a Difficult task will roll 5D for an average of 17.5, which still misses the 20 needed for Difficult. It will take a character with 8D skill Preparing and rolling 9D just to hit the average needed for Very Difficult. And per 1e p.29 you only call for the character to make a roll when they do something important. If you are performing a non-urgent mundane task the player normally won't even roll at all, so the base system should be based on not Preparing. And in 1e a combat round is 5 seconds which is a long time to do most single things as it is. And on the other side of taking 10 seconds to do a one round action, you have doing multiple things in one round, which remove dice from your roll accordingly. The fact that we have the option to add dice for taking an extra round and remove dice for doing multiple things in one round puts one round as the basis for which the game system was designed. I have no reason to believe that Preparing was the default the system was based on, and even if it was, it is still off. Rolling dice is probabilities. The averages work out in the long run, and they are even clearer without the Wild Die. What we have is die code/average incrementalism (3.5 each step) that does not synch up with the difficulty level incrementalism (5 each step until 20, then skip to 30). They are on two separate tracks and nonsensically equated to each other. The problem still exists with the 1988 patch, but it is a less impactful problem. I've been playing this game since 1e core was all there was. I would have to characterize the 5-increments difficulty charts as the biggest flaw of the entire D6 System, which is based on rolling d6s with an average roll of 3.5. For more details, please see this thread which has my solution and how I came to it.